Learning to Teach Design and Technology in the Secondary School is established as a core text for all those training to teach Design and Technology in the secondary school. It helps you develop subject knowledge, acquire a deeper understanding of the role, purpose and potential of Design and Technology within the secondary curriculum, and provides the practical skills needed to plan, teach and evaluate stimulating and creative lessons. Bringing together insights from current educational theory and the best contemporary classroom teaching and learning, this book will prove an invaluable resource for all student and newly qualified teachers – as well as their mentors - who aspire to become effective, reflective teachers. Gwyneth Owen-Jackson is Senior Lecturer at the Department of Education, The Open University, UK. 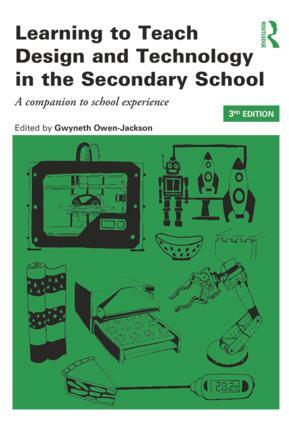 Designed for all students learning to teach in secondary schools, and particularly those on school-based initial teacher education courses, the books in this series complement Learning to Teach in the Secondary School and its companion, Starting to Teach in the Secondary School. Each book in the series applies underpinning theory and addresses practical issues to support students in school and in the training institution in learning how to teach a particular subject.